The swappable modules and pressure-sensitive base provide expressive, analog-like interfaces. The Musical Instrument Digital Interface (MIDI) arrived in the '80s to help digital instruments communicate with each other. 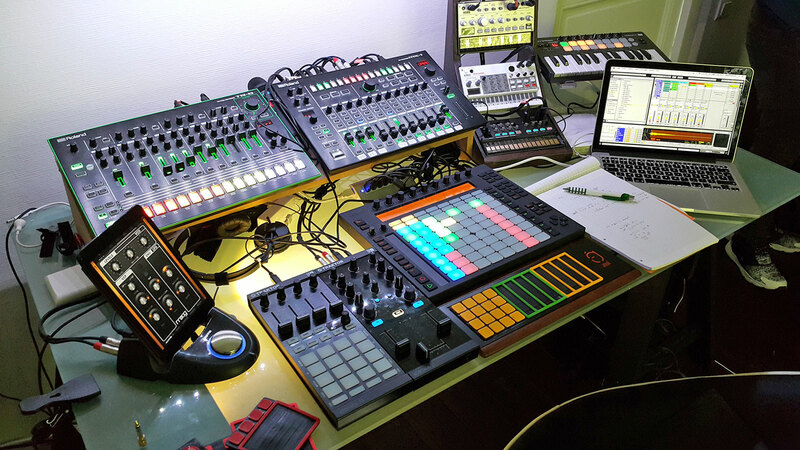 Nowadays, with much of the action on computers, a new breed of MIDI controllers has emerged. 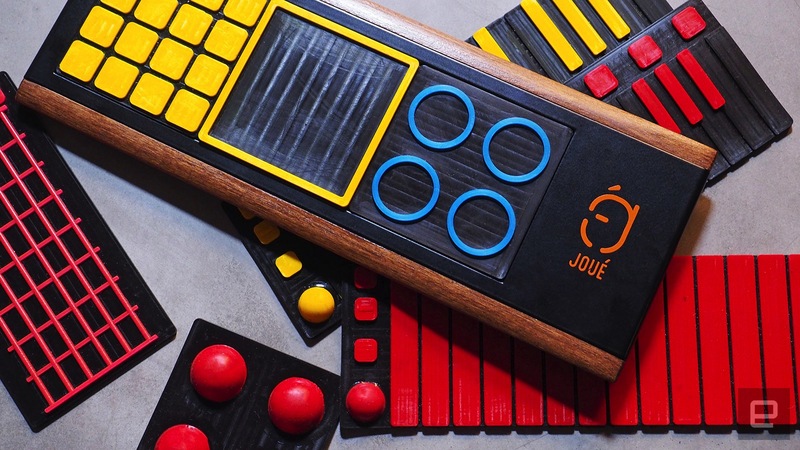 Many of today's designs include built-in pressure sensitivity to provide a semblance of analog expression when played, but Joué is a bit different. It was developed to free digital music artists from the lockstep confines of keyboards, button rows, glowing displays and marching lights, while providing modular flexibility and, above all, fun. The name Joué, translated from French, literally means "play" or can be interpreted as "I play," and the company would like you to approach the device with an open and creative mind. It's a USB-powered pressure-sensitive board that works with a variety of soft -- and occasionally squishy -- pads that are detected and uniquely identified through embedded RFID tags. You map portions of each pad to any MIDI-capable program like Ableton Live, Apple Logic, Garage Band or iPad apps to help bring your music to life. They're swappable on the fly, and the tactile interfaces offer an alternative to high-tech distractions. The device is currently on Kickstarter; the company is raising funds to move from industrial prototype to final product, and as usual, early bird deals are available. You can buy a Joué board and starter pack of pads for just over $300, with the eventual retail price expected to be under $500. This product joins the market alongside several other well-known controllers. The Ableton Push is a popular device with a glowing grid of pads and onboard controls that let you run a live set with minimal glances at a laptop. Another similar product is the LinnStrument by legendary gear maker Roger Linn. This has a wood exterior like the Joué, but maintains a backlit grid interface. Roli, which offers a series of soft-touch keyboards called Seaboard, has the closest similarity to the Joué pads, but is stuck with a keyboard layout that requires some skill to play -- unless Chopsticks is the apex of achievement for you. As a MIDI controller, Joué -- or more particularly, each RFID-tracked pad -- needs to be mapped to certain control parameters. It supports an emerging software standard called Multidimensional Polyphonic Expression (MPE), which allows more expressive parameters for each sound. Still, software support for MPE is limited, including Logic and Bitwig among its short list. Joué also supports up to 10 points of multitouch, so people can max out the usefulness with all 10 digits. Joué's pads will initially be sold in groups along with the Joué board, beginning with the Control Pack and Play Pack -- their differences being how each set is aimed to be used. You can map any pad unit to any sound function, essentially. But if, for instance, you're working with subtle adjustments and tweaks rather than playing a keyboard sequence, you'd probably choose the Control Pack. This includes a Rounds pad, which has four raised circles and acts as a sort of knob, an Area one for filter sweeps in both X and Y directions and Strips for various linear adjustments like volume or pitch bends. In addition there's the Pad, which is a four-by-four layout of squares for tapping out samples or drum sounds and finally Bubbles, which is one of the most enjoyable tactile designs. 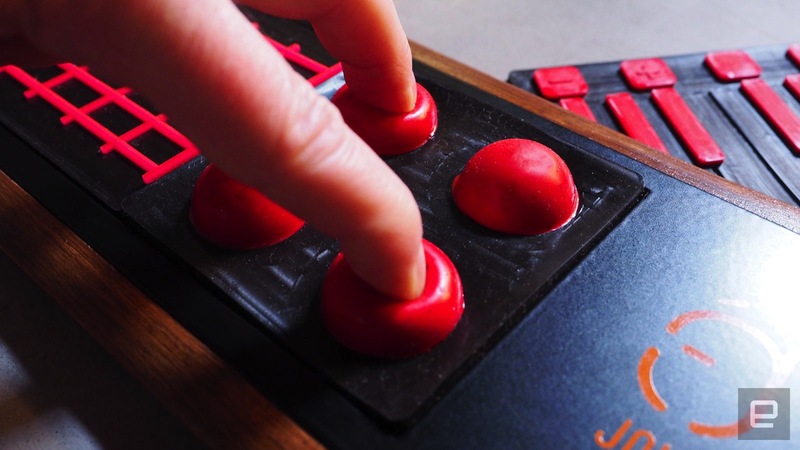 It has a series of squishy domes you can mash, press and bend at will -- an interface that embodies the ethos behind the Joué. 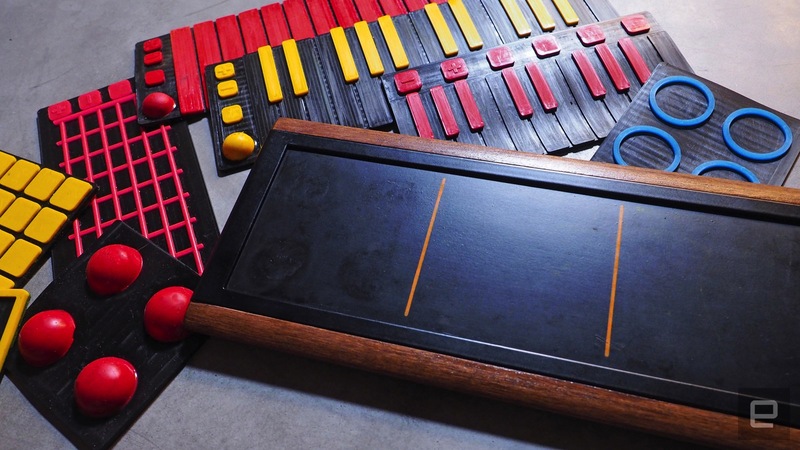 The Play Pack is easier to describe, consisting of the same Pad insert, along with a Synth (keyboard) layout, a Fretboard (guitar) and a Scaler (similar to a piano, without the black keys). These are geared toward musicians looking to play melodies or simulate guitar play. Although the Fretboard has simulated strings and frets, they're simply tactile representations. All the "bending" of a string is read by the pressure-sensitive board underneath, which does a decent job of impersonating the real thing. The unit I briefly demoed was an industrial prototype, so although it had a well-crafted wood and metal exterior, the flexible pads were a bit rougher looking than the final units will be. I'm told they'll be made of silicone, and because they're technologically minimal (just an embedded RFID) they'll be affordable when sold as add-ons (possibly less than $10 a pad). The Joué team has also started experimenting with unique interfaces that lean more toward fun than functionality. Imagine a fabric-coated design or a single pad with a 3.5-inch-wide mushy dome. Into head-banging or need stress relief through music? Go for it. In my brief experience, mushing these pads is one of the most enjoyable parts about playing with the Joué. My inner child was pleased. This isn't the first product that CEO Pascal Joguet has released. His first company, JazzMutant, launched a multitouch controller over a decade ago called the Lemur. A quick cruise through its listing of clients includes artists like Bjork, Richard Devine, M.I.A., Daft Punk and Orbital, to name a few. The design was forward-thinking, but Joguet wanted to bring back the fun of playing music without dealing with the imposing technical hurdles more complicated (albeit high functioning) devices were burdened with. Joué aims to be affordable, approachable and fun to play, on its own or as an addition to your production kit. It's a lighthearted interface that can be enjoyed without too much visual focus. You can give your eyes a break, push the laptop aside and let its tactile prompts inform your musical creation. As Joguet said, "I don't even need to use my eyes to play; my finger is the eye." 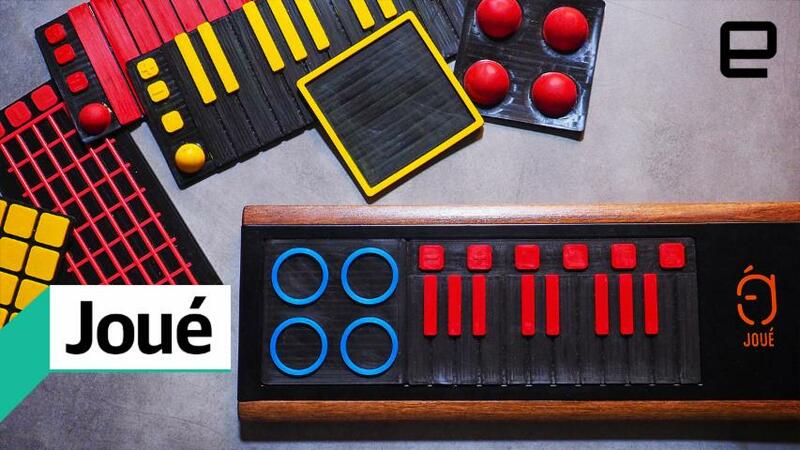 You can support Joué on Kickstarter through the middle of January.